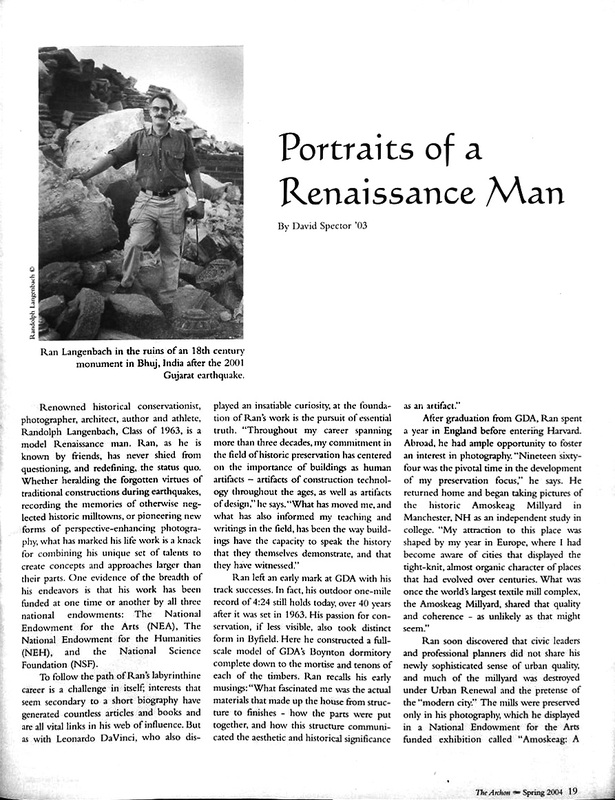 Renowned historical conservationist, photographer, architect, author and athlete Ran Langenbach, class of 1963, is a model Renaissance man. Ran, as he is known by friends, has never shied from questioning, and redefining, the status quo. Whether heralding the forgotten virtues of traditional constructions during earthquakes, recording the memories of otherwise neglected historic mill towns, or pioneering new forms of perspective-enhancing photography, what has marked his life work is a knack for combining his unique set of talents to create concepts and approaches larger than their parts. One evidence of the breadth of his endeavors is that his work has been funded at one time or another by all three national endowments: The National Endowment for the Arts (NEA), The National Endowment for the Humanities (NEH), and the National Science Foundation (NSF). Ran left an early mark at GDA with his track successes – his outdoor one-mile record of 4:24 still holds today, over 40 years after it was set in 1963. His passion for conservation, if less visible, also took distinct form in Byfield. Here he constructed a full scale-model of GDA's Boynton dormitory complete down to the mortise and tenons of each of the timbers before it was renovated in 1960. 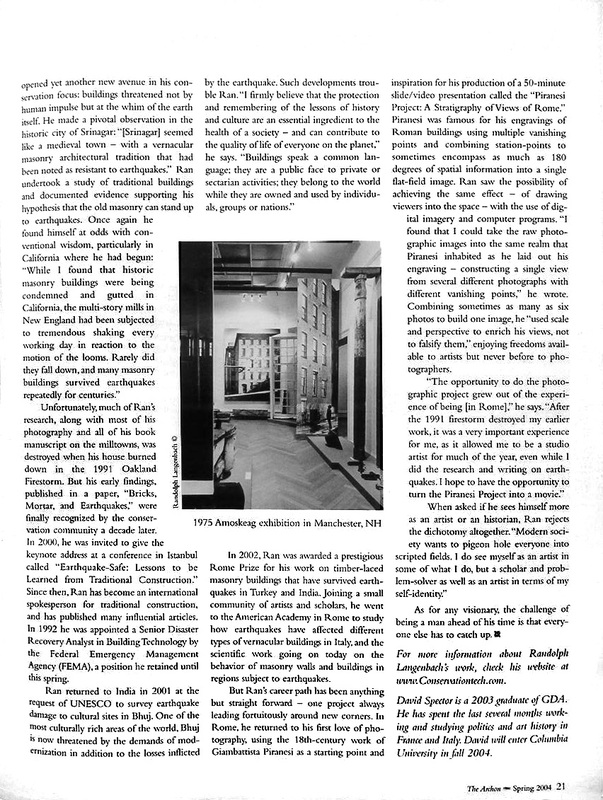 Ran recalls his early musings: "What fascinated me was the actual material that made up the house from structure to finishes - how the parts were put together, and how this structure communicated the aesthetic and historical significance as an artifact." After graduation from GDA, Ran spent a year in England before college, where he had ample opportunity to foster an interest in photography. "Nineteen sixty four was the pivotal time in the development of my preservation focus," he says. He returned home and began taking pictures of the historic Amoskeag Millyard in Manchester NH during an independent study at Harvard. "My attraction to this place was shaped by my year in Europe, where I had become aware of cities that displayed the tight-knit, almost organic, character of places that had evolved over centuries...What was once the world's largest textile mill complex, the Amoskeag Millyard, shared that quality and coherence - as unlikely as that might seem." Ran soon discovered that civic leaders and professional planners did not share his newly sophisticated sense of urban quality, and much of the millyard was destroyed under Urban Renewal and the pretense of the "modern city." The mills were preserved only in his photography, which he displayed in a National Endowment for the Arts funded exhibition called Amoskeag; A Sense of Place and a Way of Life at the Currier Gallery of Art in Manchester, New Hampshire, in 1975. During and after that exhibition, he compiled testimonials from some of the 11,000 people who attended the exhibit with the photographs in a book he co-authored with his wife, noted historian Tamara Hareven, titled, Amoskeag, Life and Work in an American Factory City. This book remains in print as one of the most respected accounts of mill life. Other projects involved documenting the mills in England and India followed. In all, Ran has published over twenty articles and books on historic mill towns and has successfully shifted the paradigms of conservation, bringing mill towns into the realm of human artifacts worthy of respect. In addition, he has written on other even more difficult topics in the field of historic preservation. “While the mill-town sometimes had a negative meaning,” he explains, “there are other places that are important to preserve specifically because they are symbols of man’s inhumanity to man – including the concentration camps of the Third Reich.” This determination in his work to tackle tough philosophical issues as they present themselves has given Ran an international reputation as a historical conservationist. He has, throughout his career, been a prolific and forceful contributor to the dialogue on conservation. Unfortunately, much of Ran’s research, along with most of his photography and all of his book manuscript on the mill towns, was destroyed when his house burned down in the 1991 Oakland Firestorm. But his early findings, published in a paper, “Bricks, Mortar, and Earthquakes”, were finally recognized by the conservation community a decade later. In 2000 he was invited to give the keynote address at a conference in Istanbul called “Earthquake-Safe, Lessons to be Learned from Traditional Construction”. 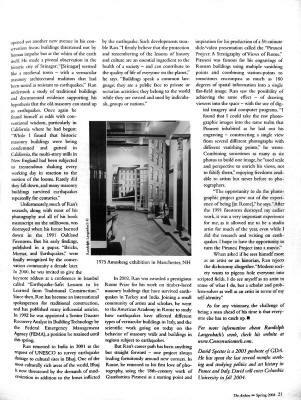 Since then Ran has become an international spokesperson for traditional construction, and has published many influential articles. In 1992 he was appointed by the Federal Emergency Management Agency (FEMA), where he remained a Senior Disaster Recovery Analyst in Building Technology until this spring. In 2002, Ran was awarded a prestigious Rome Prize for his work on timber-laced masonry buildings that have survived earthquakes in Turkey and India. Joining a small community of artists and scholars, he went to the American Academy in Rome to study how earthquakes have affected different types of vernacular buildings in Italy and the scientific work going on today on the behavior of masonry walls and buildings in regions subject to earthquakes. But Ran’s career path has been anything but straight forward – one project always leading fortuitously around new corners. 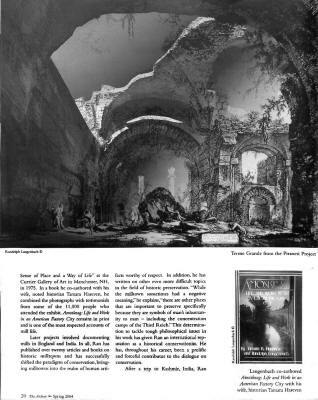 In Rome, he returned to his first love of photography, using the 18th-century work of Giambattista Piranesi as a starting point and inspiration for his production of a 50-minute slide / video presentation called “The Piranesi Project: A Stratigraphy of Views of Rome.” Piranesi was famous for his engravings of Roman buildings, using multiple vanishing points and combining station-points to sometimes emcompass as much as 180 degrees of spatial information into a single flat-field image. Ran saw the possibility of achieving the same effect – of drawing viewers into the space – with the use of digital imagery and computer programs. “I found that I could take the raw photographic images into the same realm that Piranesi inhabited as he laid out his engraving – constructing a single view from several different photographs with different vanishing points,” he wrote. Combining sometimes as many as six photos to “build” one image, he “used scale and perspective to enrich his views, not to falsify them,” enjoying the freedoms available to artists but never before to photographers. When asked if he sees himself more as an artist or an historian, Ran rejects the dichotomy altogether. “Modern society wants to pigeonhole everyone into scripted fields. 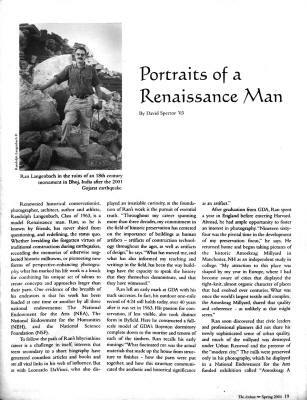 I do see myself as an artist in some of what I do, but a scholar and problem-solver, as well as an artist in terms of my self identity…” As for any Renaissance visionary, the challenge of being a man ahead of his time is that everyone else has to catch up. David Spector is a 2003 graduate of GDA. He has spent the last several months working and studying politics and art history in France and Italy during a “gap year” before entering Columbia University in fall 2004.